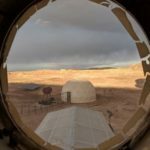 Crew 192 was on site MDRS from 7-22 April 2018. The crew consisted of Victoria Varone, Richard Blakeman, Andreea Radulescu, Ashok Narayanamoorthi and Joseph Dituri. We are all Citizen Scientist-Astronaut Candidates of Project PHEnOM. 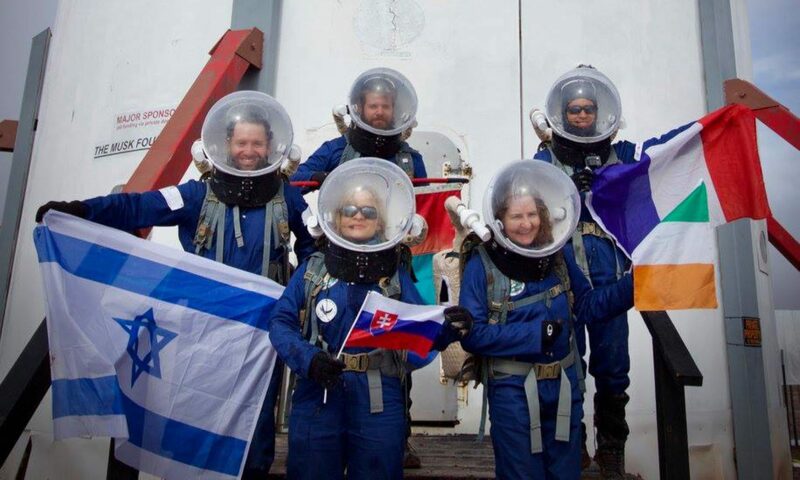 Out team emerges from varying walks of life, three different countries as well as myriad backgrounds with the common interest of space exploration. We have been preparing for this particular mission for the past 18 months since induction into Project PHEnOM. Over the course of 19 EVAs we explored the areas marked in black on Figure 1. A moderate portion of our exploration was performed on foot as the rovers and ATVs were not extensively used. A significant portion of our EVA time was dedicated to completing missions toward improving the MARS Society Habitat including: removal of the skirt from around the HAB, cleaning the water tanks from contamination, cleaning and clearing gear adrift from foul weather / high winds, repaired stair railing, repaired latch & hasp on door, and tied down loose equipment. We remained in simulation for the entire period of time sans synchronous communication with onsite mission control. We lived with and cooked with whatever we started the mission and made a superb effort to live as Martians despite some unexpected extreme weather including gale winds, freeze and fire warning. The crew remained in great sprits throughout and enjoyed our time at MDRS. We conducted a significant amount of training during the down time and enjoyed erudition from each of our crew’s vast experience. 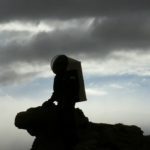 Spacesuit visor fogging study This research was conducted using a double-blind study to test Johnson’s baby shampoo and Joy dishwashing fluid and their effectiveness against spacesuit visor fogging. Both one-piece and two-piece (separate helmet) spacesuit configurations were tested along with random controls to identify variables and collect data. A rapid review of the data suggested that exertion increased fogging in both one piece and two-piece suits. Initial indications suggest that the baby shampoo had slightly superior results in fog reduction. Both products appear to have minor irritation of the nose as reported by some people but there may be confounding factors surround the irritation. Hand exercises using hand relief, well-being balls. This research was conducted as a single blind study to test the use of well-being balls for hand exercise before EVA determining the dexterity and comfort of hands. After few measurements, this study was discontinued as the exercises were creating discomfort for the crew and impacted operation. Crew wellness observations This is survey-based study using the Well-being questionnaire before, during and the end of the study to measure the happiness scale of the crew. This is on going and will continue after we leave MDRS. Crew weight measurements and analysis (EVA) Daily weight measurements were taken along with the pre and post EVA analysis. Preliminary results indicated the weight loss after EVA is proportional with duration of EVA and physical exertion. Unable to stipulate the primary cause but the doctor recommended sufficient hydration and caloric intake before and after each EVA. Crew muscle measurements Daily crew skeletal measurements including deltoid and calf muscles were taken. Preliminary analysis show reduction in deltoid muscle in majority of the crew. This appears to be due to continuous depletion of glycogen storage. Use of MAGs during EVA Crew wearing MAGs (Maximum Absorbency Garments) before every EVA and their feedback were obtained. Initial results show slight discomfort with long duration EVA but helpful in extending the duration of EVA. Ultrasonic rodent repulsion experiment Three off the shelf plug-in ultrasonic rodent repulsion emitters were placed in the lower habitat, crew quarters deck, and the upper level deck. There were two intrusions of rodents during the mission located on the crew living deck near the refrigerator and the ceiling area of the HAB. A trap was baited with a small piece of bread coated with peanut butter and the intruding rodent was captured unharmed. On a subsequent EVA the rodent was released on Galileo Road (Route 1104). An additional rodent intruder was discovered during the night in the south-side, upper level, interface between the wall and the habitat roof structure. The intruder rodent was caught in a glue trap and did not survive. The initial conclusion is that the ultrasonic rodent repulsion emitters are ineffective. Physical traps should be continuously deployed to capture intruder rodents and additional repulsion technologies tested. Astronomy discussions and visual observations Conducted night time observational astronomy lectures describing various constellations and planets. The crew was able to observe several satellites and wonder at the incredible view of the heavens above. 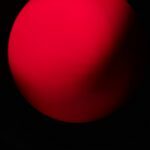 Additionally, conducted daytime solar observations using the MDRS solar telescope array. However, computer interface issues and some clouds affected viewing. 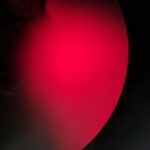 Some imagery was obtained using the optical sun lens and a smart phone. Geology observations conducted during EVAs Each EVA offered a rich and immersive experience into the local geology. Close physical inspection of structures as well as photographic and video imagery was taken for later discussion and analysis. EVA touch screen glove testing The crew brought several types of touch pad sensitive gloves to use during EVAs. These proved to be an invaluable tool for the crews as it allowed direct interface with multiple touch screen electronic recording devices. Recommend that these be used by future crew to assist with video and photographic imagery. Water contamination prevention and mitigation procedures All of the habitat water storage tanks were meticulously cleaned and sanitized over the course of many days to remove any contamination and tank residue; additionally, multiple fresh water transport and loading runs to and from Hanksville was accomplished by the crew. The water transfer pump was also meticulously clean to prevent future contamination. The main water filter was also replaced by the crew. Yuri’s night distilled spirits experiment We used a partial ration of our potatoes, apples and bananas as well as yeast and sugar to force the distillation of a celebratory spirit which was both a crew morale booster and a fascinating chemistry experiment. The process took several days to complete and the resulting product was equally distributed to each crewmember in a celebratory toast to the accomplishments of Cosmonaut Yuri Gagarin for becoming the first human in space April 12, 1961. Spacesuit hydration prototype system operational testing and evaluation An experimental prototype EVA hydration system was constructed and operationally tested on multiple EVAs both mounted and dismounted. This system has shown promising results as it can be utilized while operating a rover, ATV, as well as dismounted EVAs. Astronaut hydration, particularly during heavy exertion, is an important physiological need and critical to crew safety. 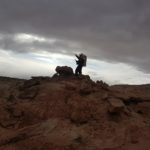 We thoroughly enjoyed our time at the MDRS and learned a few things about analogs. Our crew was well prepared for this mission. 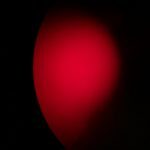 Given the significant experience of the crew, more autonomy and decision-making authority, as would be expected on a mission to Mars with a Mission Support some 140,000,000 miles away, would have improved our simulation. Time(s) of watering for crops: Twice: In the morning around 8:45 am and afternoon 5:30pm. Narrative: No significant changes. Picked another batch of tomatoes as well as a couple of peppers. 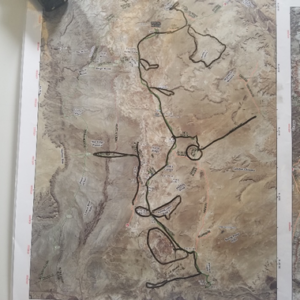 Objectives: Exploratory reconnaissance of Cactus Road (Route 1104), continued testing of helmet fogging study and hydration pack. Narrative: Conducted an exploratory reconnaissance of Cactus Road (Route 1104) via Galileo Road (Route 1104). Stopped at interesting geologic formations for detailed examination and to collect video and photo imagery. Conduct both mounted and dismounted EVA. Objectives: Exploratory reconnaissance of Reservoir Dam, Tank Wash, and Factory Butte View. Continued testing of helmet fogging study and hydration pack. 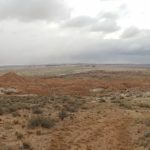 Narrative: Conducted an exploratory reconnaissance of the Reservoir Dam, Tank Wash, and Factory Butte View regions. The EVA was conducted using a combination of ATV and dismounted scouting. Stopped to examine multiple geologic formations and collected video and photo imagery. 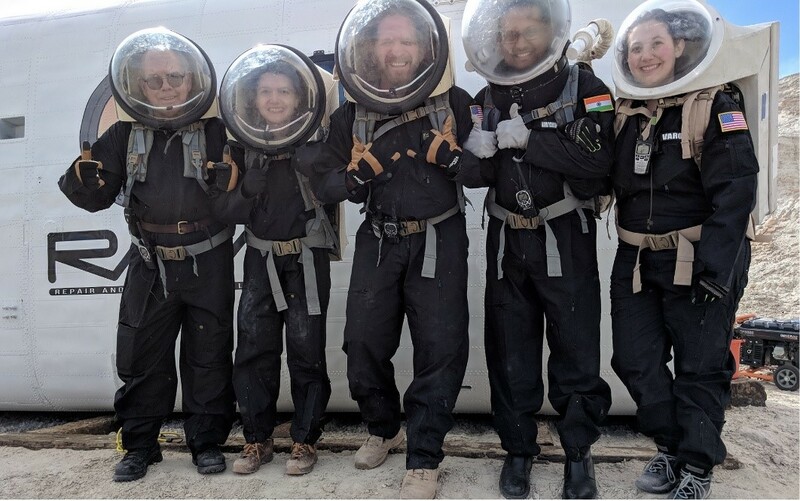 Sol Activity Summary: The crew divided up our last day in sim into two fantastic EVAs and a mission to clean the hab from top to bottom for the incoming crew and close out all of our reports. 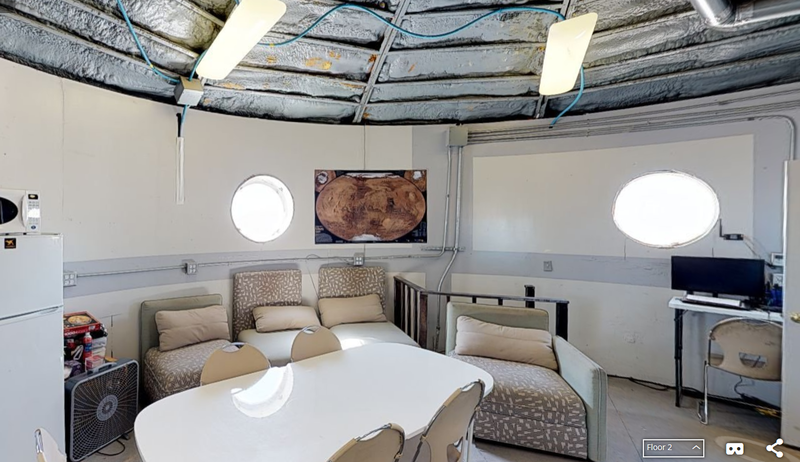 We went through each of the buildings in the hab site and made sure everything is clean, organized, and in great shape for use by future crews. Look Ahead Plan: Finishing up our last reports and inventories to prepare for incoming crew and our departure. Weather: Cloudy and rainy in the morning, warmer and sunny in the afternoon. Support Requested: Note: Filter for loft water tank is already light brown/orange in color. Maintenance request: Lock for Musk Observatory is no good anymore, it was severely jammed and we tried various fixes but it still sticks. Recommend replacement. Also we will need fluorescent light bulbs soon, They are flickering. Finally had to secure the water under the sink in the upstairs sink because the leak has gotten worse. Non-nominal systems: Upper deck faucet, hot water now has to be turned off when not in use because it leaks too much, causing water loss and constant noise from the pump. Propane – 60% (telemetry reported by Shannon) psi. Ethanol Free Gasoline (5 Gallon containers for ATV) – 25% gas left in one can. Water (trailer) – Empty water tank secure on Trailer. Toilet tank emptied: Yes. Last emptied today, April 20. Oil Added? No but checked and OK last time road. Notes on ATVs: ATVs fine, oil checked. General notes and comments: Cleaned the hab from top to bottom to prepare for incoming crew. Summary of suits and radios: Suits all charging, two one-piece suits used, radios working fine. Comms headpieces all cleaned and prepared for incoming crew. Summary of Hab operations: Cleaning and organizing for Crew 193. Summary of ScienceDome operations: Last cleaning check. Summary: The Sun came out after a bit of rain and a lot of clouds this morning, so I took advantage of the clear skies to get in some solar observing. 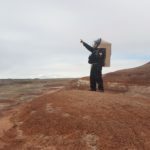 This report describes the outcomes of the science and research projects conducted during the MDRS Blue Crew 192 mission. It should be noted that on some of the research studies, the primary data collected requires additional time for analysis and conclusions. This research was conducted using a double-blind study to test off the shelf cleaning products (Joy dishwashing liquid and Johnson’s Baby shampoo) and their effectiveness against spacesuit visor fogging. Both one-piece and two-piece (separate helmet) spacesuit configurations were tested along with random controls to identify variables and collect data. The data will require analysis before any final conclusions can be made; however, preliminary data suggests that exertion levels contribute to fogging phenomenon. Additionally, baby shampoo appears to have slightly superior results in fog reduction. There were occasional reports of minor irritation but it appears to be not significant. Crew muscle measurements Daily crew skeletal measurements including deltoid and calf muscles were taken. Preliminary analysis show reduction in deltoid muscle in majority of the crew. MAG (Maximum Absorbency Garment) utilization (MAG, i.e. Depend-type undergarments) were worn by crewmembers on all EVAs. This provided additional crew comfort, health, welfare, and safety protection on increasingly longer and complex EVAs. 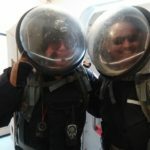 NASA and the military use the MAG protocol for missions involving extended operations involving pressure suits, EVA space suit, and undersea hard suits where waste collection issues can significantly impact crew heath and mission success. Ultrasonic rodent repulsion experiment Three off the shelf plug-in ultrasonic rodent repulsion emitters were placed in the lower habitat, crew quarters deck, and the upper level deck. There was only one intrusion of a rodent during the mission located on the crew living deck near the refrigerator. A trap was baited with a small piece of bread coated with peanut butter and the intruding rodent was captured unharmed. On a subsequent EVA the rodent was released on Galileo Road (Route 1104). An additional rodent intruder was discovered during the night in the south-side, upper level, interface between the wall and the habitat roof structure. The intruder rodent was caught in a glue trap and did not survive. The initial conclusion is that the ultrasonic rodent repulsion emitters are ineffective. Physical traps need to be continuously deployed to capture intruder rodents and additional repulsion technologies tested. EVA touch screen glove testing The crew brought several types of touch pad sensitive gloves to use during EVAs. These proved to be an invaluable tool for the crews as it allowed direct interface with multiple electronic recording devices. Recommend that these be used by future crew to assist with video and photographic imagery. All of the habitat water storage tanks were meticulously cleaned and sanitized over the course of many days to remove any contamination and tank residue; additionally, multiple fresh water transport and loading runs to and from Hanksville was accomplished by the crew. The water transfer pump was also meticulously clean to prevent future contamination. The main water filter was also replaced by the crew. Yuri’s night distilled spirits experiment The distillation of a celebratory spirit was both a crew morale booster and a fascinating chemistry experiment. The process took several days to complete and the resulting product was equally distributed to each crewmember in a celebratory toast to the accomplishments of Cosmonaut Yuri Gagarin for becoming the first human in space April 12, 1961. 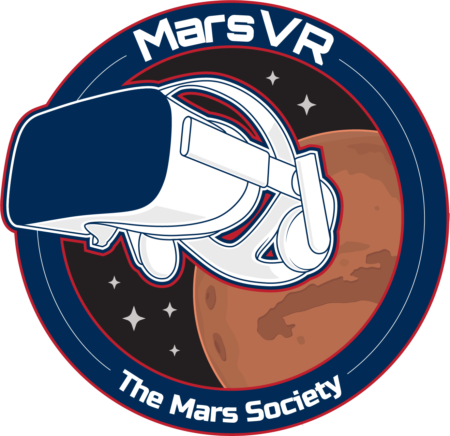 Still and video imagery Still and video imagery has been collected by all crewmembers throughout the mission in order learn and better appreciate the challenges and requirements necessary to be an effective Martian crew.